Cows are discussed in detail in our scriptures. Here are some of the quotes that glorifies the cow and cow protection! Oh Cows! With your milk and ghee you make the physically weak strong, and nurture the sick to health. With your sacred utterances, you chastise our homes. Your glory is discussed in gatherings. The Gods and men live on cow products. Till the Sun shines, the universe will have Cows. 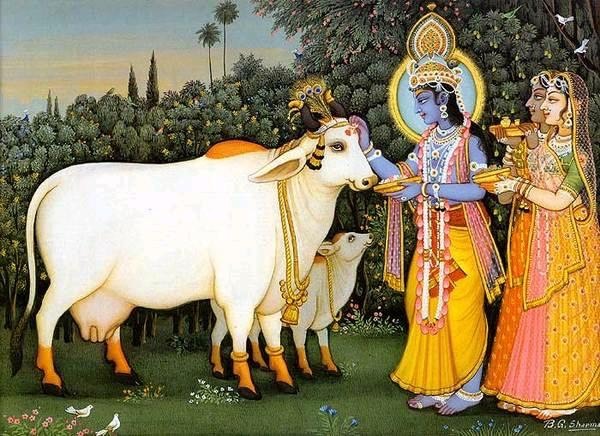 The whole universe depends on the support of cow. dhenunam asmi kamadhuk dhenunam-among cows, asmi-I am, kamadhuk-the wish fulfilling cow, Among cows I am the wish fulfilling cow. Cows are equivalent to our mothers for when the mothers milk has dried up the cow gives her milk unselfishly to noursih and strengthen us. How can one who has ever drunk cows milk justify the killing and eating of such a mother as the sacred cow. One should never even in one’s mind do injury to a cow or ever think of harming cows as well as bulls. One should show all respect and compassion for cows and sincere reverence should be offered unto them all without reservation.